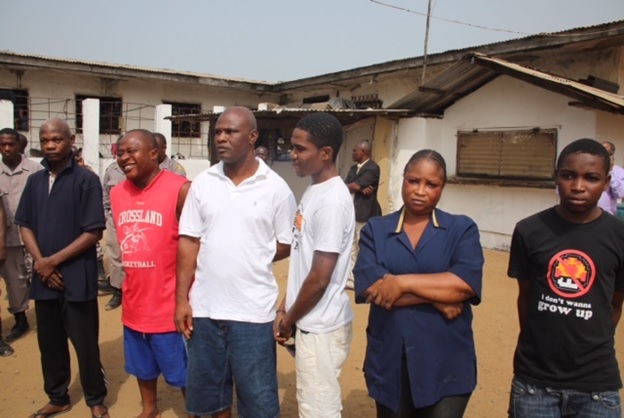 Monrovia - From life sentence to total freedom – four of nine Grand Gedeans convicted and sentenced to life for mercernarism activities in neighboring Ivory Coast have been granted executive clemency by President Ellen Johnson Sirleaf. They bring to eight of a total of 13 who have been acquitted of the crime. Those pardoned by the President include Ophoree Diah, Emmanuel Saymah, Jacob Saydee and Moses Bayee who were tried and convicted for Mecenarism from the Monrovia Central Prison. They are part of a total of 13 the President freed on Friday, December 30, 2016. The others include Wuo Gballah, Ms. Oretha Gono, Yei Dokie, Peter Zuweh and Jerome Zuweh were convicted for vandalizing properties of Arcelor Mittal in Nimba County and released from the Buchanan Central Prison - while Prince Sayemie, Victoria Dolo, Hassan Morris and Kou Saye were released from the Sanniquellie and Monrovia Central Prisons. The Grand Gedeans were accused in 2012 of carrying out mayhem and mercenary activities in Ivorian towns closer to the Liberian border. They were also linked to the killing of seven Nigerien peacekeepers and at least 10 civilians on June 8, 2012 near Tai, Southeastern Ivory Coast and fighting side-by-side with militias loyal to former Ivorian President Laurent Gbagbo. Hearing an appeal from the defendants which emanated from blanket guilty verdict and a subsequent life sentence in Criminal Court “D”, the Supreme Court by a unanimous decision lifted the sentence on Isaac Taryon, alias Wolie Taryon, Prince Youty, James Lee Cooper and Sam Tarley alias Bull Dog for lack of sufficient evidence to link them to the crime and satisfactorily establish their guilt. However, after review the records from the lower court and finding the remaining nine guilty, the Supreme Court opined that “the voluntary statements of these appellants/defendants duly made during their investigation by the police and in the presence of their counsels connected them to the crime of mercenarism with which they were charged; thus, their uncorroborated testimonies of general denials are insufficient to warrant the reversal of the judgment of conviction entered against them in the lower court”. The Court also held that, with additional evidence provided, the State had “satisfactorily proved the crime of mercenarism” against the nine persons. The nine were Nyazee Barway, alias Joseph Dweh, Morris K. Cole, alias Edward Cole/General Girl, Steven Gloto. Alias Rambo/Ninja, Emmanuel Saymah, alias Trainer, Moses Baryee, alias Moses Sarpee, Sam Ofori Diah, Alfred Bobby James, Jr., alias Bobby Sarpee, Jacob Saydee and Mohammed Massaquoi. In September 2015, the president of the Grand Gedeh Association in America, Fred Gwyan, termed the prolonged detention of his kinsmen a factor that diminishes the benefits of over a decade of peace. He appealed to Vice President Joseph Boakai to deliver a special message to President Ellen Johnson Sirleaf to grant executive clemency for their kinsmen, and hoped that the clemency will help foster peace, unity and reconciliation in Liberia. He was, however, assured by Vice President Boakai that the government had nothing against his kinsmen which was evidenced by presence of several Grand Gedeans serving various positions in government. Also calling for the release of the remaining nine convicts after the Supreme Court’s ruling in September, Representative Bhofal Chambers who chairs the House Committee on National Defense and Security underscored total reconciliation and urged President Sirleaf to release the Grand Gedeans. He observed that due to the prolonged detention of the 13 Grand Gedeans many citizens of the county were not happy with the Government, and noted that such could impede the reconciliation gains the government has made over the years. President Ellen Johnson Sirleaf admonished the released prisoners to endeavor to be good and law-abiding citizens by helping their communities promote peace as well as to help report and prevent crimes. “As I grant you clemency today, let me urged you to return to your respective communities with positive attitudes and serve as good ambassadors for the promotion of peace and national development”, she told the pardoned prisoners. She called on the released prisoners to think and act positively and seek to be patriotic and nationalistic citizens. She further urged them to be good ambassadors for reconciliation and national healing across Liberia. “You all need to know that you committed crime, came before the court of law and were found guilty. What we are doing here now is an act of goodwill based on your behavior after conviction. So, by the virtue of the authority granted me by the constitution, I hereby set you free and may God be with you,” President Sirleaf said. Speaking earlier, Justice Minister Frederick Cherue informed President Sirleaf that the 13 prisoners were recommended for clemency due to positive behavior exhibited in prison following their conviction. “The prison centers are not meant for punishment only. It is also a place for rehabilitation and correction and we are convinced that the 13 prisoners being recommended for clemency are fully rehabilitated and corrected,” Minister Cherue pointed out.